Schweizer Monat was a partner of the Eurozine network from July 2012 to March 2015. The Schweizer Monat is the monthly Swiss magazine on politics, economics and culture. Founded in 1921, it has a liberal profile and contributes to the public intellectual discussion. The Schweizer Monat is independent, critical and committed to quality. Since 2010 it has been published by its own publishing house, the SMH Verlag AG, thereby guaranteeing the journalistic freedom that is indispensable for an idiosyncratic magazine. The oldest monthly publication of Switzerland was first published in 1921 under the title Schweizerische Monatshefte. Its founders emerged mainly from an academic environment and were targeting a similar audience. Although very diverse in their background, they were united by a scepticism towards Swiss membership in the League of Nations, which obtained a majority in a popular vote in 1920. The founders’ lack of trust was based on a possible préponderance française and a decrease in the importance of the German-speaking culture. From the outset, the young magazine served as a platform for engaged discussion. An issue of heated debate at the time was liberalism, which later became one of the hallmarks of the journal. After World War II, the newly composed editorial staff followed a liberal course. Under the title Schweizer Monatshefte für Politik, Wirtschaft und Kultur, the journal offered international authors the opportunity to publish their contributions in the German-speaking area. Karl Popper, Ludwig von Mises, Wilhelm Röpke and Friedrich August von Hayek originally published numerous essays in the Schweizer Monatshefte. Intellectuals like Herbert Lüthy, Arnold Gehlen and Theodor Adorno, as well as writers like Hermann Hesse, Hermann Burger and Hugo Loetscher, helped establish the journal’s reputation at a European level. In June 2010 the journal was re-launched and the publishing house SMH Verlag AG founded in order to guarantee greater independence. 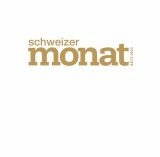 Since March 2011, the journal appears under its new name Schweizer Monat. Since May 2011, every second issue includes the Literarischer Monat, a supplement focusing on Swiss literature.